Time of Origin: Skaro, originally from centuries in the past but has survived to the far future thanks to such means as suspended animation and time travel. 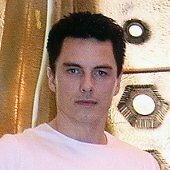 Appearances: "Genesis of the Daleks", "Destiny of the Daleks", "Resurrection of the Daleks", "Davros", "Revelation of the Daleks", "The Juggernauts", "Remembrance of the Daleks", "Daleks Among Us", "Terror Firma", "War of the Daleks", "The Stolen Earth/Journey's End", "The Curse of Davros", "Daleks Among Us" and "The Magician's Apprentice/The Witch’s Familiar". Doctors: Fourth Doctor, Fifth Doctor, Sixth Doctor, Seventh Doctor, Eighth Doctor, Tenth Doctor and Twelfth Doctor. Companions: Sarah Jane Smith, Harry Sullivan, K9, 2nd Romana, Tegan Jovanka, Turlough, Peri Brown, Flip Jackson, Melanie Bush, Ace, Elizabeth Klein, Will Arrowsmith, Samantha Jones, Charley Pollard, C’rizz, Rose Tyler, Mickey Smith, Captain Jack Harkness, Martha Jones, Donna Noble and Clara Oswald. History: In many ways, Davros may very well be the only being The Doctor has ever encountered who was more evil than the Daleks; while the Daleks’ belief in their superiority over other forms of life could be excused by the fact that they were programmed to believe such was the case from the moment they were created, Davros knew both good and evil throughout his life, and nevertheless chose to program the Daleks - his great legacy to the universe - to know nothing but evil and destruction. Originally, Davros was one of the greatest scientists of the Kaled race, one of two races that existed on the planet Skaro, engaged in a prolonged civil war with Skaro’s other dominant race, the Thals. The two races had long been at war with each other, each one stationed in a city protected by a huge dome, and their resources so depleted that they now fought with a mixture of modern and ancient weaponry and defences. As a child Davros claimed only his mother believed in him, while others feared him and his determination. His father wanted him to become a soldier like his elder generations, but Davros was determined to become a scientist. Disagreeing with his sister Yarvel’s belief that a compromise with the Thals was possible, Davros was forced into the military, where he was put in charge of developing new weapons. After his mother killed his father, sister and aunt, Davros no longer had anyone that he could impress, with his mother dedicating herself to helping her son’s career to the point where Davros came to be regarded as an infallible scientific genius. Even in death, Davros’s mother helped his theories; when she sacrificed herself to stop a soldier who had been sent to kill Davros, she used one of her son’s machines to expose herself and the soldier to a lethal radiation dose, thus accelerating the mutation that she - and the Kaled race as a whole - were already undergoing and giving Davros a better look at what they would become. Shortly after this, Davros was horrifically crippled in a bombing raid, but, unable to bring themselves to end the life of their greatest scientist, the Kaleds instead gave Davros a poison injector so he could do it himself. Perceiving their sympathy as weakness, Davros vowed to live so that a new, stronger race would be born, turning his attention to the long-term effects of the war. Over the course of the war, the use of chemical and biological weapons caused some members of the population to mutate, prompting scientists to begin research to determine a means of dealing with the mutation. Having already found inspiration in the work of Shan - described by Davros as the most beautiful, intelligent Kaled ever - when she wrote a paper about the “Dalek Solution” as a means of allowing the species to survive in the aftermath of the Kaled/Thal conflict despite the damage done by the weapons over the course of the war, Davros began his work in earnest. Although intrigued by her work, Davros later betrayed Shan when he learned that she was involved with Councillor Valron. Planting information to suggest that Valron was a Thal spy, Davros had all of Valron’s associates arrested, including Shan, due to his own inability to admit to himself that he was in love with her. Concluding from a combination of Shan’s paper and his own research that the mutation was inevitable and unstoppable, Davros, rather than seeking a cure, diverted his attention to creating a machine that could transport the Kaleds’ final mutated form. Resolving that his ‘Daleks’ would become the ‘supreme victor’ in the universal wars that he believed would be inevitable, Davors altered the Dalek creatures’ genetic make-up, increasing aggression, removing their conscience and instilling in them the notion that they were superior to all other life. Despite the efforts of the Fourth Doctor - sent by the Time Lords to avert or delay the creation of the Daleks -, Davros was unable to be swayed from his goal, but realised too late the flaw in his programming; as they believed themselves superior to everything, the Daleks saw no need to obey his orders. As The Doctor trapped the Daleks in the Kaled bunker - he refused to kill the entire Dalek race as it would have made him no better than they were, and his actions still delayed the Dalek development by around a thousand years -, the Daleks seemingly exterminated Davros, vowing that they would some day emerge to conquer all. Returning to Skaro literally centuries after his last visit, the Fourth Doctor and the newly-regenerated Romana were shocked to discover that the Daleks had returned, seeking to revive Davros; as it turned out, the Dalek attack after their activation had not killed him, but merely trapped him in a state of suspended animation thanks to his chair’s defences. Confronting a robot race called the Movelleans, The Doctor learned that the Daleks and Movelleans were currently at war with each other, but their reliance on logic rather than impulsive emotion meant that their battle computers were locked in a deadlock calculating the best possible plan of attack; every time one of their ships moved to begin a new battle strategy, one of the enemy’s ships automatically moved to compensate for the shift, leaving them permanently locked in a stalemate with not one single shot having yet been fired. The two sides had come to Skaro to recover Davros in the hope that he would be able to program them with the initiative necessary to overcome this defect, but Davros instead attempted to destroy the Movellean ship by reprogramming a group of Daleks to act as a ‘suicide squad’ by loading them with bombs and sending them to the ship, seeking to re-establish himself as leader of the Daleks. Having tricked Davros into activating the bombs early, The Doctor deactivated the Movelleans and cryogenically froze Davros until the Daleks’ now-freed human slaves could take him back to Earth to stand trial for his crimes. Although The Doctor had hoped that their last encounter would see the end of Davros, the Daleks were unfortunately able to rescue their creator from the space station that he was trapped in after his trial, seeking his aid in creating a cure for an anti-Dalek virus that had been created by the Movelleans. As well as this, the Daleks created a time corridor into Earth’s past, replacing key figures with android duplicates, with their main goal being to capture The Doctor and his companions - one of these traps featuring a time corridor linking the space station where Davros had been restored to a warehouse on Earth in the 1980s -, replace them with androids, and send the androids to assassinate the High Council of Time Lords. Fortunately, although they managed to capture the Fifth Doctor, Tegan Jovanka and Turlough in the corridor, one of their previously created duplicates rebelled and destroyed the space station, thus leaving the duplicates without anything to control them and The Doctor confident that their conditioning would wear off and allow them to live normal lives among society. At the same time, The Doctor released samples of the Dalek virus onto the Dalek ship, killing the Daleks and forcing Davros to flee in an escape pod as the virus began to affect him due to his Dalek components. Somehow managing to cure himself of the Movellan virus, Davros was later discovered in the vault of a freighter owned by the galactic bank by Arnold Baynes and his wife Lorraine, the CEOs of the TAI corporation, taking Davros’s apparently dead body back to their homeworld just as The Doctor arrived. Reviving Davros to offer him a position as head of R&D at the company, the Baynes were able to attract Davros’s interest by their campaign idea of offering mankind services before they knew they needed them, with The Doctor getting himself hired as joint R&D head to keep an eye on Davros now that he had acquired a position of power. Although Davros claimed to have reformed after sending decades in suspended animation, unable to do anything but reflect on how petty his actions were, The Doctor vowed to keep an eye on him. Disturbed by Lorraine’s desire to write his autobiography - Lorraine regarded him as the greatest scientific mind in history -, Davros nevertheless set to work solving the problem of an intergalactic famine, calculating a formula that allowed him to predict the rate of any exchange of stock. 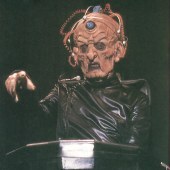 Having discovered the formula, however, Davros then intended to make it public, thus triggering an economic collapse that would allow him to implement a new economic plan based on Skaro’s wartime economy, with criminals doing hard labour, ordinary citizens making weapons, and only those with special aptitudes becoming the ‘galactic elite’. Reflecting on his past with Lorraine, Davros concluded that he couldn’t change, and thus triggered a nuclear explosion that would vaporise all the workers on the planet after tricking Lorraine into transferring her executive power to him just after he’d apparently killed Baynes. Having escape the blast, The Doctor subsequently destroyed the communications console to prevent Davros broadcasting his formula, but Davros managed to gain control of an escape ship, using a young woman called Kim The Doctor had befriended as a hostage with the poison injector that he had been given long ago and kept to that day. Knowing that The Doctor could control the ship as long as it remained within the atmosphere, but also knowing that he dared do nothing while her life was at risk, Kim injected herself with the poison, thus leaving The Doctor free to activate the ship’s hyperdrive and crash it into the planet. Following this confrontation, The Doctor again faced Davros - who had escaped the crash by using an escape pod - allied with his creations during a visit to the planet Necros, where the wealthy could have their newly-deceased bodies cryogenically frozen until such time as medical science could cure whatever killed them. Investigating the death of a friend, The Doctor discovered that the ‘Great Healer’ of the facility was in fact Davros, who was using the organic material in the cryogenic storage units both as the raw material for the synthetic food that was Necros's biggest export - hence contributing to his attempts to destabilise the galactic market and release his formula - and also to create a whole new army of Daleks with which to take control of the universe. Thankfully, the arrival of Daleks loyal to the Supreme Dalek averted Davros’s plans, with the Daleks arresting their creator - shooting off his hand in the process - and destroying his makeshift Daleks, simultaneously ignoring The Doctor as they didn’t recognise him due to his regeneration (The only occasion where the Daleks were unable to instantly identify The Doctor). As The Doctor would later learn, however, Davros never made it to Skaro; the ship he was on was attacked and crashed on the doomed mining colony Lethe, and he was the only survivor. Taking advantage of his initial injuries in the crash concealing his identity, Davros used an engineered virus to make the colonists perceive him as simply an old man in a wheelchair and assumed the alias of Professor Vaso, subsequently creating the ultimate anti-Dalek weapons by adding human nervous tissue to The Mechanoids, large robots that the First Doctor had encountered on the planet Mechanus that were created to protect the colonists but were abandoned when the colony never received any inhabitants. Renaming the redesigned Mechanoids the ‘Juggernauts’, Davros turned them into the ultimate anti-Dalek weapon, aided in their programming by none other than The Doctor’s companion Mel, who had become separated from The Doctor after the medical spaceship they were on was attacked and Mel was forced to leave in an escape pod. Although he told The Doctor that the Juggernauts would revert to their default programming as terraforming robots after the Daleks had been eliminated, his use of living human subjects to provide the necessary nervous tissue proved to The Doctor that Davros hadn’t changed, forcing him to call in the Daleks - who had recruited him to help them capture Davros - to battle the Juggernauts. As both sides fell fighting each other, Davros’s self-destruct system was activated as a result of the damage that his chair had sustained, forcing The Doctor and Mel to flee to the TARDIS before the subsequent explosion wiped out the colony (How Davros survived this is unknown; the most likely explanation is that he was able to retreat to an escape pod which contained a back-up life support system, thus abandoning his chair while allowing himself to continue). Having established himself as the Dalek Emperor of his own group of Daleks once again, Davros’s next scheme involved him having perfected a mind-swap machine, allowing him to place Dalek minds in human bodies and thus creating the perfect means of infiltrating his enemies’ forces. To test this new technology, Davros travelled back to 1815 to alter the outcome of the Battle of Waterloo ("The Curse of Davros"), concluding that the victory of Napoleon Bonaparte - regarded by Davros as humanity’s best tactician, untainted by the racial madness and superstition of other leaders - would set humanity on a path where they may become the Daleks’ allies, even revealing his true identity to Napoleon to secure his allegiance (Although he naturally intended to betray Napoleon and leave a Dalek in his mind after the battle was won). Fortunately, the Sixth Doctor - apparently an earlier version of The Doctor that Davros had last encountered - discovered Davros’s presence in this time period, infiltrating Davros’s command ship and using the mind-swap machine to exchange minds with Davros - simultaneously damaging the machine so that Davros couldn’t undo the swap before the Daleks came back -, forcing Davros to escape in The Doctor’s body while The Doctor used Davros’s body - noting that he could barely stand the constant pain that had driven Davros for his centuries of life - to take control of the invasion. Having landed in 2012, Davros was ‘rescued’ by Philippa ‘Flip’ Jackson, an acquaintance of The Doctor’s ("The Crimes of Thomas Brewster"), Flip unintentionally helping Davros track down the Daleks so that they could take him back to 1815, Davros knowing that The Doctor would want his body back. Although Davros was able to pass himself off as The Doctor long enough to return to the Dalek ship, Flip quickly saw through his deception when ‘The Doctor’ threatened to shoot the crippled Davros, Flip knowing that The Doctor would never do such a thing. Although Davros had no interest in returning to his own body, enjoying The Doctor’s healthy and pain-free form, The Doctor was able to use his command of Davros’s Daleks to keep Davros locked up long enough for him to explain the situation to Flip before Davros convinced the Daleks of his true identity. Fortunately, Davros decided to spare The Doctor and Flip so that they could both suffer as he had, allowing Flip’s boyfriend Jared - who had accompanied them into the past - to rescue them, the three raiding the Dalek armoury while Davros’s Dalek-minded humans aided Napoleon’s forces. While Jared provided the British with additional Dalek weapons, The Doctor and Flip were able to trap Davros and swap their bodies back, although The Doctor expressed regret for the fate that he was condemning Davros to after experiencing his foe's pain. Having convinced the Daleks that Davros was still The Doctor, he was locked up once again, giving The Doctor time to convince Napoleon of Davros’s real agenda, Napoleon accepting his defeat to spare humanity from conquest by the Daleks. Having set Davros’s ship to drift aimlessly in the vortex, The Doctor and Flip departed, leaving Davros with a group of mind-wiped Daleks after The Doctor reprogrammed the machine to simply erase the Daleks' minds, Davros confident that he could re-educate the Daleks to obey him (The machine apparently failing to work on Davros, most likely because his brainwaves were slightly different than the Dalek brainwaves). The Seventh Doctor’s initial encounter with Davros pushed him further than ever before, mainly since it was such a personal confrontation; not only were two factions of Daleks at war around Coal Hill School - the school which Susan had attended and where the First Doctor had originally met Ian and Barbara and begun his travels -, but they sought the Hand of Omega, a Time Lord relic that would allow the Daleks to harness the power of time travel, hidden on Earth by The Doctor himself. Despite the aid of a group of soldiers, the Hand was eventually claimed by the Imperial Daleks, led by Davros - who had discarded the last of his human form (Possible further evidence of him having escaped the colony’s destruction by abandoning his old life support system in favour of a new one) and now called himself the Dalek Emperor - but The Doctor revealed that it was all part of an elaborate trap, with the Hand sending Skaro’s sun supernova and subsequently returning to Earth to destroy the Dalek fleet. With the Dalek ships destroyed and Davros apparently dead - although he retreated to his escape pod, it was unknown whether he had managed to get far enough away in time - The Doctor confronted the Dalek Supreme - the sole surviving Dalek - with its status as the apparent last of its kind, causing it to self-destruct. Several years after this encounter, seeking to tie up some loose ends in this life in case his next incarnation was less equipped to deal with things in his manner, the Seventh Doctor recruited UNIT scientist Doctor Elizabeth Klein and her assistant Will Arrowsmith to find the Persuasion Machine, a machine created by Nazi scientist Kurt Schalk that could convince anyone to believe what the original programmer wanted ("Persuasion"). After being lured to an alien auction while tracking a fake Schalk that had been set up as a distraction ("Starlight Robbery"), The Doctor tracked the machine to Azimuth, a world where he had once fought off a Dalek invasion with Ace, only to find that the population had chosen to erase The Dalek invasion from their history, to the extent that they were arresting anyone who even mentioned 'the D-word' ("Daleks Among Us"). While Klein tracked her own connection to the Machine, The Doctor and Will learned that Davros was on the planet, posing as the leader of a group attempting to expose the 'truth' about the Dalek presence, when in reality he was trying to find the remnants of an old project where he had sought to create a clone of himself to transfer his mind into. When The Doctor and Davros discovered that the clone had develoed its own personality and identity, calling himself 'Falkus' after Skaro's second moon and regarded by at least the Daleks on Azimuth as the Supreme Dalek, Davros expressed some admiration of Falkus's attempt to use the Persuasion Machine to simply convince Azimuth's population to die, as well as his earlier plan to try and torture The Doctor to learn about all of the Time Lord's past victories simply so that he could undo them. However, since the Machine relied on Klein to control it after she was specifically 'engineered' to have the necessary strength of conviction to operate it, The Doctor and Will were able to help Klein break the Daleks' programming, killing the Daleks and Falkus while Davros was forced to flee in a Dalek time capsule (He was briefly sent to the planet Lamuria, previously visited by The Doctor and inhabited by the 'ghosts' of a race who sought to punish all criminals or their descendants, but it would appear that Davros eventually managed to escape their punishment). 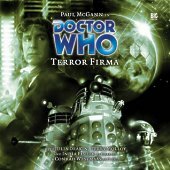 Following his return to his home reality after a period of exile in the anti-time universe, the Eighth Doctor, Charley Pollard and new companion C’rizz were shocked to find themselves on an Earth that had been conquered by Davros and the Daleks ("Terror Firma"), with only small pockets of human resistance remaining in parts of the world and disguising their intentions by pretending to be focused on nothing but having parties. While C’rizz and Charley escaped capture, The Doctor talked with Davros, learning that not only was Davros suffering from multiple personality disorder - one personality being Davros while the other identified itself as the Dalek Emperor - but, recalling the Fourth Doctor’s query about whether Davros would release a virus if he knew it would destroy all life, he had actually created such a virus using technology from an alien ship he had discovered when he was sent into the Time Vortex after his last defeat, as well as another virus that he had released on Earth earlier to mutate millions of humans into Daleks. On a more personal level, Davros revealed that he had actually forced The Doctor to help him achieve this; after The Doctor had materialised on board the ship where Davros had been trapped since the destruction of Skaro, Davros had captured The Doctor’s then-companions Samson and Gemma Griffin and used them to force The Doctor to take him to Earth, subsequently manipulating the TARDIS to erase The Doctor’s memory of the Griffin siblings before he departed, leaving Davros to spread a Dalek-creating virus across Earth for the sole purpose of destroying The Doctor’s home like The Doctor had destroyed his while The Doctor travelled with Charley and C’rizz in complete ignorance of Davros’s schemes. Despite Davros’s pleas for The Doctor to kill him - his mind now torn between a desire to end his twisted life and a desire to continue it - The Doctor refused to allow Davros to drag him down to his enemy’s level, allowing the Daleks to destroy a clone that Davros had created with the intention of transferring his mind into a new body. As a result of the trauma caused by the clone’s destruction, the Dalek Emperor persona took total control of Davros and subsequently left for space with the Daleks, The Doctor leaving Davros’s virus with the British resistance to use against the Daleks if they should ever return. Some time after Charley and C’rizz’s departure, The Doctor found himself facing off against the Daleks once again, this time accompanied by Samantha Jones (Although the evidence would suggest that this encounter took place before the "Terror Firma" encounter as far as Davros was concerned). Having arrived on a Thal spaceship, The Doctor was horrified to discover that the Thals had recovered Davros’s escape pod and were intending to force Davros to engineer the Thals to become better warriors, only for the Daleks to discover Davros and take him back to Skaro to answer for his crimes against the Dalek people. During the subsequent trial, the Dalek Supreme informed Davros that Skaro had not been destroyed; having learned about Skaro’s destruction from records during their invasion of Earth, the Daleks - finding themselves unable to change history by such actions as their attempt to invade in "Day of the Daleks" - had instead transferred Davros, still in stasis, to another planet that had been terraformed to resemble Skaro, subsequently creating the Movelleans to provide them with a reason to awaken him and thus allow history to unfold as it should while leaving Skaro intact. As Davros was about to be sentenced, however, Daleks loyal to him moved to rescue him, resulting in a civil war that gave The Doctor and Sam the chance to escape with the Thals, The Doctor subsequently ejecting a Dalek factory ship that had been planted on the Thals’ vessel into the Time Vortex (The ship in question being the one that the Second Doctor fought in "The Power of the Daleks") and departing in the hope that the Thals would be encouraged to return to their old ways after what he had told them. Back on Skaro, Davros was sentenced to matter dispersal, but he was apparently able to reprogram the Dalek at the controls, thus allowing him to escape as the Dalek teleported rather than disintegrating him, (presumably) beginning the steps that would lead to his mental instability in "Terror Firma". When the new television series began, although the Daleks were swiftly revealed to have been rendered all but extinct as a result of the last great Time War between the Time Lords and the Daleks - the war culminating in The Doctor triggering the destruction of ten million Dalek ships, apparently at the cost of Gallifrey - Davros took some time to appear, Russell T Davies seeking to re-establish the Daleks’ independence from their creator rather than the over-reliance that had been demonstrated in their last televised appearances. Even without actually appearing, Davros was clearly not forgotten; both the Ninth and Tenth Doctors referred to Davros when reflecting on the Daleks’ history, the Ninth describing Davros as a man who was 'king of his own little world' and the Tenth noting Davros’s belief that lack of emotions made the Dalek race stronger, although neither Doctor identified Davros by name. In a more indirect reference, the evil John Lumic, a wheelchair-bound genius from an alternate Earth who created the Cybermen of his reality, clearly owes at least some elements of his appearance to Davros; both of them were crippled, wheelchair-bound geniuses who claimed to be acting in the interests of their species by turning them into a different form of life (Although there were significant differences; Davros made the Daleks in the image of what he had become due to outside influence while Lumic made the Cybermen in the image of what he wanted to become by choice, and Davros was mostly lying when he referred to the Daleks as the only hope of survival for his people whereas Lumic seemed to genuinely believe what he was saying). When he finally returned to the series - now with a mechanical hand to replace the one that he had lost years ago - it was revealed that Davros was presumed dead in the first year of the Time War at the Gates of Elysium, when his command ship flew into the jaws of the Nightmare Child despite The Doctor’s efforts. However, when Dalek Caan fled New York after the destruction of the rest of the Cult of Skaro, his emergency temporal shift somehow allowed him to jump past the temporal lock placed on the war to travel back in time and rescue Davros, although the process drove him mad as he perceived the entirety of time. After Davros created a new race of Daleks from the very cells of his body - although the Daleks still treated him as inferior due to his non-Dalek status, keeping him in a prison at the base of their ship - the Daleks went on steal twenty-seven planets from across all of time and space, bringing them together in the Medusa Cascade and hiding them from The Doctor by keeping the entire Cascade a second out of sync with the rest of the universe. Tracking the planets to the Cascade, The Doctor learned that Davros had arranged the twenty-seven planets into a pattern that they would use to generate neutrino energy in a single stream, which, when compressed on a specific location, would cause the electrical fields holding matter together to collapse, the destruction thus travelling through the rift to the entire multiverse - the weapon, naturally, being known as the ‘Reality Bomb’. Although The Doctor’s companions tried to stop the Reality Bomb - Martha Jones by threatening to use a weapon called the Oosterhaagen Key that would trigger strategically-placed nuclear bombs to destroy Earth while Sarah Jane Smith, Captain Jack Harkness, Mickey Smith and Jackie Tyler threatened to detonate the Crucible with a gem containing a pocket explosion that Sarah possessed - Davros simply taunted The Doctor for his refusal to fire weapons even as he turned those he met into soldiers, transmatting the companions to his location to witness his victory and avert their attempts. However, thanks to the actions of a part-human ‘clone’ of The Doctor - due to The Doctor averting his latest regeneration by channelling the regenerative energy that would have changed his appearance into his spare hand, the hand subsequently creating a new Doctor based partly on Donna Noble’s DNA while also granting Donna access to Time Lord knowledge - Donna was able to reprogram the Reality Bomb to backfire, subsequently sending the planets back to their proper places in time while the second Doctor triggered the Daleks’ self-destruct; Dalek Caan’s ‘prophecies’ had all been made with the intention of ending the Daleks once and for all, having perceived the pointlessness of their actions on the universe as a whole. Although The Doctor tried to save Davros, Davros denounced him as the Destroyer of Worlds and refused his offer, the TARDIS thus departing the Crucible just as it detonated, although Davros was able to escape under unspecified circumstances. Two lifetimes later, while travelling alone, the Twelfth Doctor accidentally landed on Skaro's distant past, where he found himself in the unique position of having the chance to save a child from a minefield, only to learn that the child was a younger version of Davros who'd somehow wandered into the battle, prompting him to leave the battlefield and Davros, unwilling to either kill Davros or save his life ("The Magician's Apprentice/The Witch's Familiar"). In the 'present', a now-dying Davros sent out a mysterious agent to find The Doctor, Davros wanting to pass a message on to The Doctor as he faced the end of his life, claiming that he had now remembered their 'first' encounter and presenting The Doctor with the screwdriver The Doctor had left behind as evidence. With Clara and Missy - The Master's new female incarnation ("Dark Water/Death in Heaven") - as additional hostages, The Doctor confronted Davros in his chamber on the restored Skaro, Davros reminding Doctor of both of their first encounters, when the Twelfth Doctor refused to save Davros as a child and the Fourth Doctor had mused on the ethics of killing the Daleks at their beginning. Although Clara and Missy were apparently exterminated by the Daleks as Davros taunted The Doctor about how his compassion had led to the destruction of his friends and ship, they escaped by Missy configuring a vortex manipulator to be powered by the energy of the Dalek blasts, leaving The Doctor to confront the weakened Davros. Playing on The Doctor's sympathy, Davros expressed admiration of The Doctor having saved Gallifrey and his people ("The Day of The Doctor"), claiming that he regretted some of his past actions and wished merely to see the sun with his original eyes one last time. When The Doctor offered Davros access to his own regenerative energy to keep him alive, Davros revealed that his true goal was to trick The Doctor into empowering the Daleks with Time Lord energy, but The Doctor in turn revealed that he had guessed Davros's plan after Missy destroyed the equipment, with his donated energy empowering even the Daleks in Skaro's 'sewers' (Really Daleks who were too damaged to operate with the rest of their people) as they rose up against the other Daleks. Although uncertain if Davros would survive that encounter, after Clara was able to ask for mercy while she was trapped in a Dalek casing, The Doctor travelled back to save the young Davros, musing that mercy was important whatever side people were on in a war.